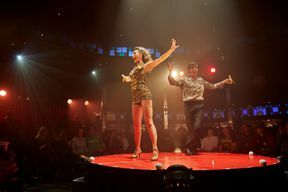 Come one, come all and come often to the delicious, deviant and delirious LA SOIRÉE. LA SOIRÉE features an ever-changing line-up of some of the best acts in the world and will feature guest appearances from acclaimed local and international artists. The daily line-up is subject to change. 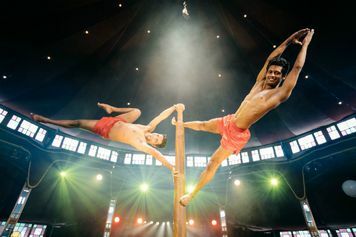 This year’s heady cocktail of ridiculously talented artists include London debuts from the Chilly Brothers with their gravity-defying cradle act, Mallakhamb India! performing the amazing and ancient indian artform, German champion aerial artist Lea Hinz, daringly dexterous Michele Clark, Fancy Chance and her mischeivious hair hanging, Leon Fagbemi and Klodi Dabkiewicz’s sensuous Hand To Hand, Electrifying Symoné on hula hoops and home-grown hackney talent, Lj Marles. 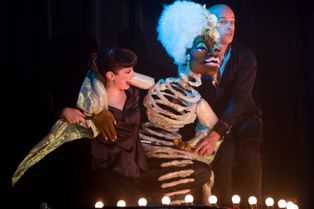 Returning LA SOIRÉE favourites include the side-splitting Amy G, Montreal puppeteers Cabaret Decadense, who will be getting the party started, and Daredevil Chicken Club - you’ll never look at a banana the same way again. La Soiree is not available to book, please sign up to our newsletter for updates and offers on forthcoming and available shows.